Hi Sweet Shoppers! 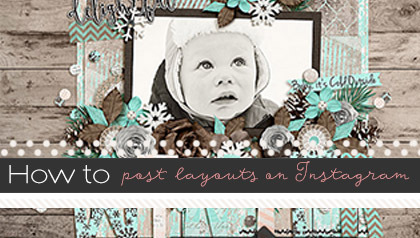 Lex here to show you my super-simple methods of saving favorite scrapbook layouts for easy viewing and access. If you’re like me, you’re constantly blown away by the talent in the scrapping community and regularly go dizzy keeping track of layouts you love. Most scrapping galleries have a “save to favorites” function, but since I visit so many, it was way too easy to get confused or overwhelmed. 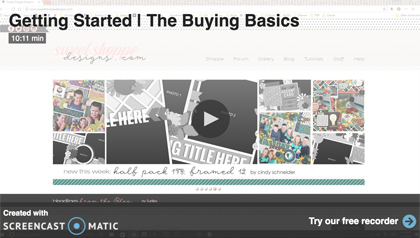 I wanted to have all the layouts I loved in one location (or in this case, two!). 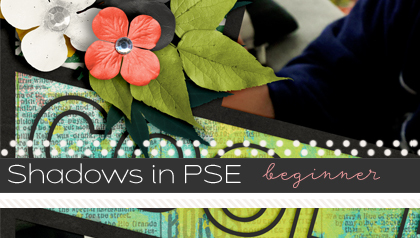 So I figured out a way to sort of bookmark layouts, either to scraplift in the future, to study for its technique, or to just continually ogle over. 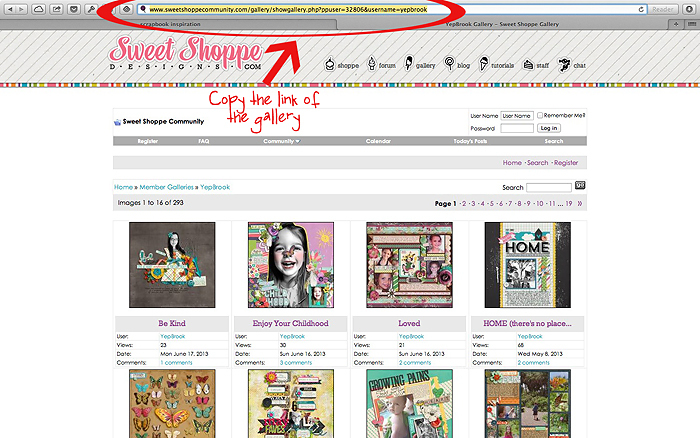 Sooo, what if I am in love with a specific scrapper’s gallery? I use another method so that I can easily see their galleries and browse to my heart’s content. Consider it friendly scrappy stalking! 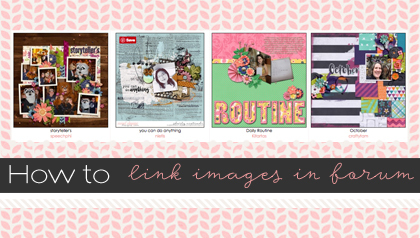 Did you know that most scrapbooking galleries are RSS feeds as well? 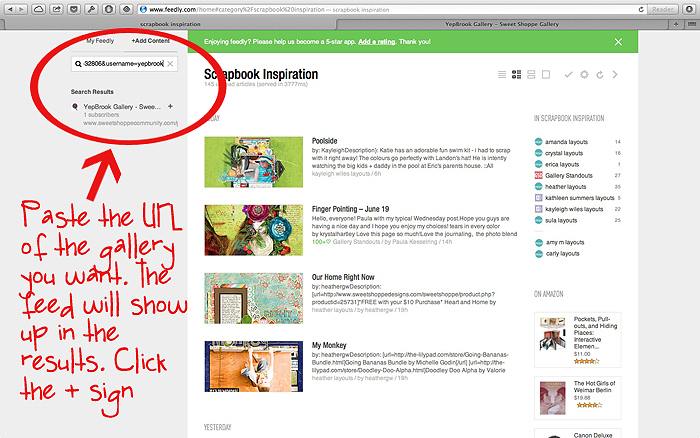 This means you can use your RSS reader to “bookmark” specific galleries. Here I have SugarBabe Brook’s gallery at SSD. I simply copy the URL to her gallery (CMD + C for Macs or CTRL + C for PCs). 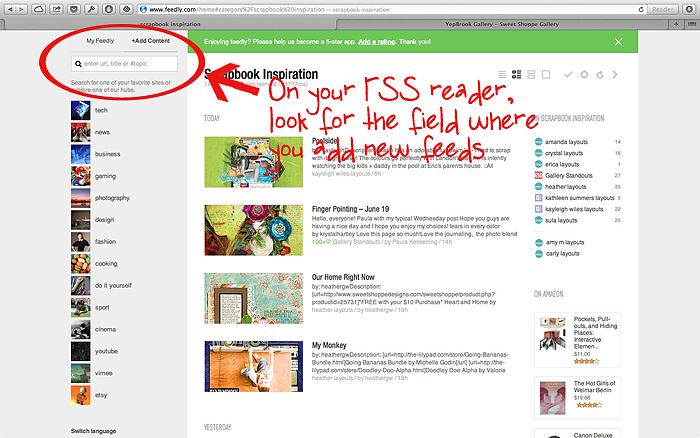 Then I go to my RSS reader–Feedly—and bring up the prompt that saves the feed. I paste the URL and Brook’s gallery comes up in my reader’s search results. Then I click the plus sign beside the search result. Then I simply rename and add it to my specific category for galleries I’ve saved. As you can see, I stalk more than a few galleries! 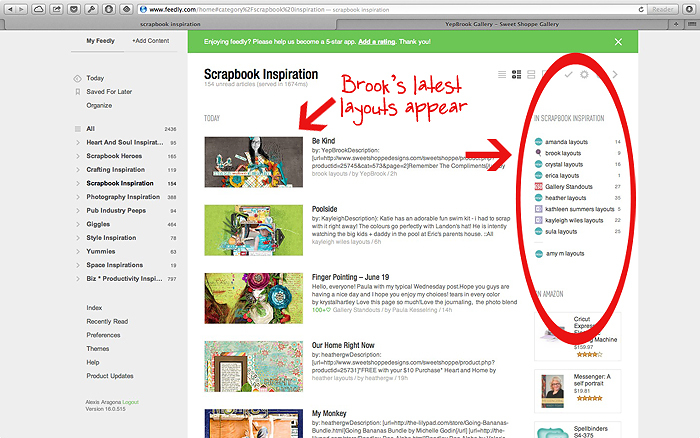 Brook’s gallery is now included in my category for Scrapbook Inspiration. The beauty of this method is Feedly lets me know when any of these favorite scrappers of mine upload a new layout. It even includes their credit list! 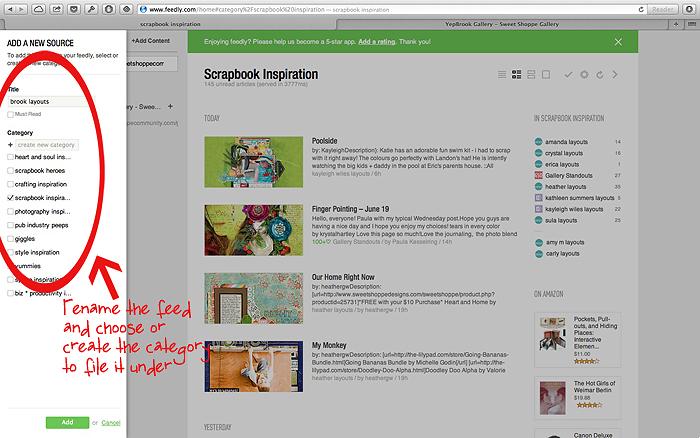 If there is a specific layout of theirs I want to bookmark to scraplift, I can either use Feedly’s Save For Later function or again, go directly to the layout and pin it to Pinterest. Hope this is helpful! 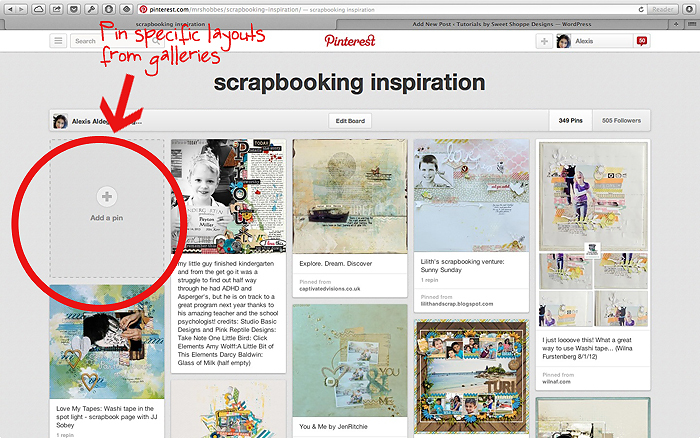 What are your own methods of curating scrapbook layouts for inspiration?